Sticky Vegan Cinnabuns for National Sticky Bun Day! Yes it's a thing. Google it. National sticky bun day! So since it's official, it would be rude not to indulge on the very day that is solely dedicated to those irresistible, gooey little buns of pure joy, right? The first people to add honey and nuts to their bread were the Ancient Egyptians. Glazed pastries have been popular ever since! German settlers in Pennsylvania created our modern-day sticky buns. The pastries were originally called “Schnecken” and are still considered a Philadelphia specialty today. Traditional recipes call for a glazed topping with pecans, maple syrup or honey, cinnamon, and oozing with butter. However, know there are many health conscious individuals out there, not to mention various diet restrictions and we don't want anyone to be left without on such a special day. 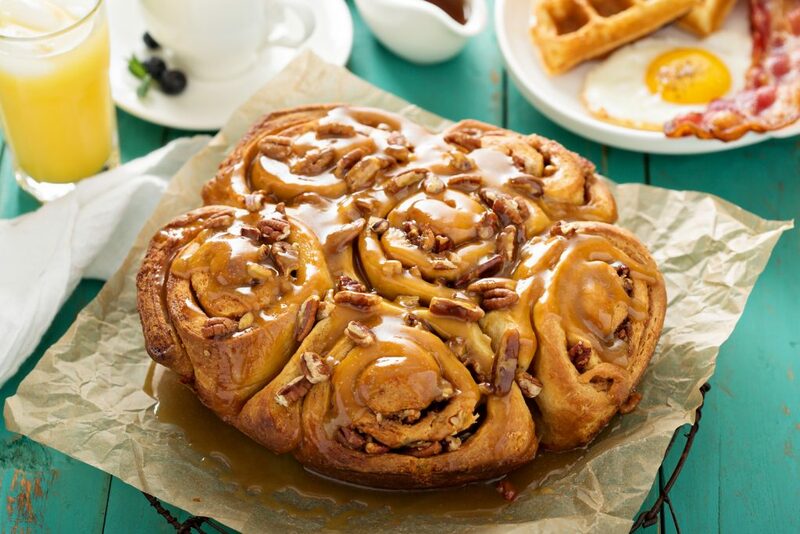 therefore, we would like to introduce our favourite ooey gooey vegan (and gluten free option) sticky pecan cinnabuns... [caption id="attachment_1773" align="aligncenter" width="660"] Sticky pecan buns on southern breakfast table[/caption] Now there is no excuse to not celebrate! Combine all dough ingredients in a mixer with a dough hook attachment. Knead for 6-8 minutes or until the dough is smooth and elastic. Coat the dough ball in a light amount of coconut or canola oil, place in a large bowl and cover with a damp dish towel. Let the dough ferment at room temperature until it's doubled in size. On a lightly floured surface, roll the dough out into an approx. 19" X 16" rectangle. Spread evenly with ¼ cup vegan butter or coconut oil, 1 tbsp cinnamon, ¼ cup coconut or brown sugar, raisins and pecans. Starting from the longest edge closest to you, roll the dough away from you (encasing the filling inside.) Place the rolled dough seam side down and cut into 8 equal pieces. Line an 8" cast iron skillet or baking pan with parchment paper, spread with a little bit of vegan butter or coconut oil, top with a sprinkle of coconut or brown sugar and some chopped pecans. Place a single cinnamon bun, cut side facing up, into the center of the pan and group the remaining buns around the center one. Cover with plastic wrap and a damp tea towel and refrigerate overnight to rise. The next morning, take cinnamon buns out of the fridge and bring them to room temperature. Preheat oven to 300F. Bake cinnamon buns for 35-40 minutes. Important: About ⅓ of the way through cooking, cover them with a layer of aluminum foil to prevent them from getting too brown. Combine all ingredients, bring to a simmer in a small saucepan and cook for 5-10 minutes over low heat. Pour immediately over warm cinnamon buns, working some of the pecans and raisins into the crevices on top. Combine all ingredients in a high speed blender, blend until smooth and creamy. Add more almond milk to thin if necessary. Allow the cinnamon buns to nearly cool before drizzling over the mixture as this will give the best appearance. (For cashew frosting: Reduce almond milk to 1 tbsp. Do not tin with additional almond milk.) Chill before whipping with a whisk and spreading over the cooled buns.